It does not speak intellectually. Light or the absence of light, what we call “shadow”, make us experience weightlessness and stimulate associations that lead to emotions. The installation Window Sash from the series In the Shade of an Olive Tree is a figurative object and, as such, suggests a vague storyline. Yes, at the same time, the element of time and motion takes our abstract thinking to the next level. 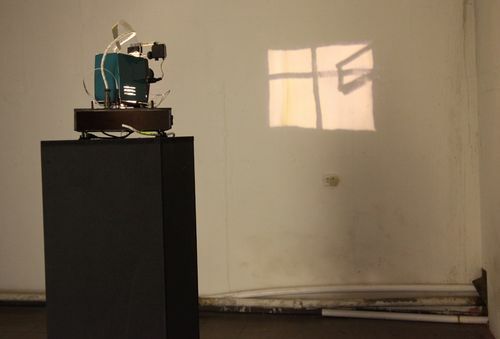 The window sash’s shadow travels in the empty space during 24 hours with the help of an ancient Soviet slide projector placed on the specially programmed Lazy Susan. Color of the light that “falls” from the window is controlled by painted 35 mm glass plates that the slide projector switches at the “appropriate” time of day. Of course, it is of no small importance at what point in time the 24-hour cycle begins.